This is what happens when I have leftovers. I throw stuff together and give it a name. I had ground beef cooked and in the fridge. I added Jack Daniels barbeque sauce No.7 recipe, 1/2 cup of corn and poured that into a cast iron skillet. Then I mixed up my cornbread recipe and poured on top. Topping that with a handful of shredded colby/cheddar cheese blend. Into the oven at 350 degrees until the cornbread was done and golden brown. Dinner is served. We had leftover cucumber salad with it and the meal was complete. Last nights supper was horseshoes, fresh cucumbers and banana pudding. Ah yes, horseshoes! How we love them. I know, you're think what the heck is a horseshoe that you can eat? Well, several years ago while watching Diners, Drive-Ins and Dives with Guy Ferrari he went to this diner that served horseshoes. The diner had their own secret spicy cheese sauce. You can make up your own, buy queso or cheese dip. There are several varieties of horseshoes. You can make them with chicken, burgers or breakfast. Our favorite is chicken, however we do love the breakfast ones as well. If you don't like your food to touch or mix together like one of my boys, you will not want these. He eats the same thing we do, just separated on the plate and no gravy. It is a pile on love fest of food. You may a stack. 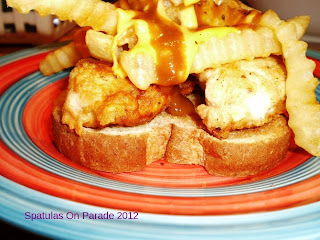 Toast, chicken, fries, gravy, cheese sauce. Wa-la there it is. Dessert last night was a wonderful cold don't get the house hotter than we have to sweet burst of flavor I like to call World's BEST banana pudding. Loved by one and all. Line a large casserole bowl or baking dish with wafers, top and bottom. Crush a handful to fill in the cracks. In a large bowl mix the milk and water until combined well. Add in the pudding mix one at a time. Peel and slice the bananas and add to the mix. Fold in Cool whip. Pour into the bowl. 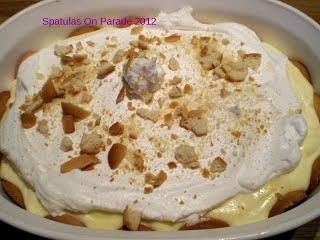 Top with more Cool Whip and a handful of crushed wafers for garnish. Let this sit in the fridge for several hours so the flavors can marry. What a wonderful dish and a great use of fresh garden veggies. The recipe called for tomatoes but I was out so I substituted sweet red bell pepper. We loved it this way, next time I will use the tomatoes and see which way we prefer. You can decide as well, let me know. I would love some feedback on these recipes. If you try one, please come back and let me know if you followed the directions, did your own thing and what the response from your family was. Saute onion and garlic in oil. Thin slice the remaining vegetables. Spray a 8 x 8 baking pan. Spread the onion and garlic on the bottom. Place thin sliced vegetables in the pan, standing up. Alternate the vegetables. 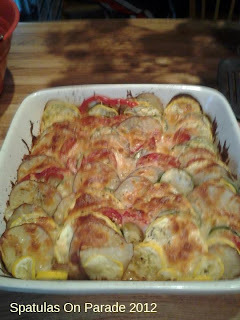 Squash, zucchini, potato, tomato and continue in rows until the pan is full. Now sprinkle with thyme, salt and pepper. Bake for 30 minutes covered with foil. 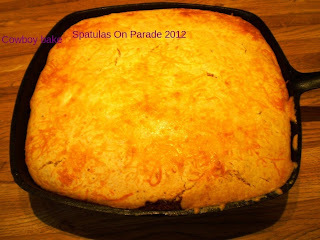 Then uncover and top with cheese and bake another 20 minutes. Several years ago, due to health reason, I went vegan. I mean overnight, tossed out all the food in the house, cleaned the fridge, cabinets and everything. As you can tell by my recipes, I am no longer vegan or even vegetarian. It is a difficult lifestyle to adopt when you've been raised 'country' and love food. However, there are some recipes that I still use. During my transition to vegan and back again, I tossed this together one day and it has become not only a house favorite but friends near and far love it as well. My youngest son dubbed it "penne bean" which has stuck. In a large pot melt the butter and add the first 5 ingredients, saute. Once the onion is translucent add the remaining ingredients, EXCEPT the noodles. Allow this to simmer for several hours for best results. When you are ready to eat, turn up the heat and add the noodles. Cook until the noodles are done to your liking. Serve with a nice roll and salad. 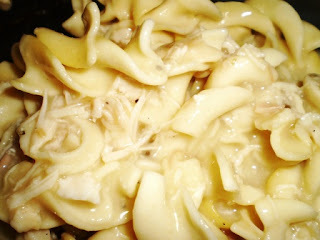 I use the yellow box Barilla noodles due to the Omega 3 and protein levels in the noodles. They add a wonderful flavor. I have made the soup using different noodles and it never taste as good. This is an old favorite. I will give you the recipe as it is in the church cookbook from many years ago. However, I will note my own changes. Cause ya'll know by now I don't stick to the written recipe, not even my own. Roll your strips in the flour, season with salt and pepper, Saute in oil until done. Add pineapple and cook another 5 minutes. Mix together remaining ingredients and pour over chicken. Allow to thicken and serve over rice. Now I cut my chicken into bite size pieces,also at times I add pea pods, broccoli or thinly sliced carrots. Either way you choose, it is a big hit. I like to use Basmati rice as it is flavorful all on its own and adds a nice extra to the dish. If you choose to cook it as the recipe suggest, serve with broccoli or a nice salad. This is cooked in one of my many favorite pans! My Cuisinart pan. I do dearly love to cook in it. Some recipes are born out of necessity and others out of want. This one serves as both. We love the breakfast casserole so much that we have it for breakfast, supper and at potlucks. Everyone is always excited to see it on the table. You can do this many ways, as I have or stick with whatever version is your family's favorite. I have seen several versions, this is how I fix it. Recently while visiting my parents I made this and my dad loved it so much that he requested it again two days later. Guess it was hit! 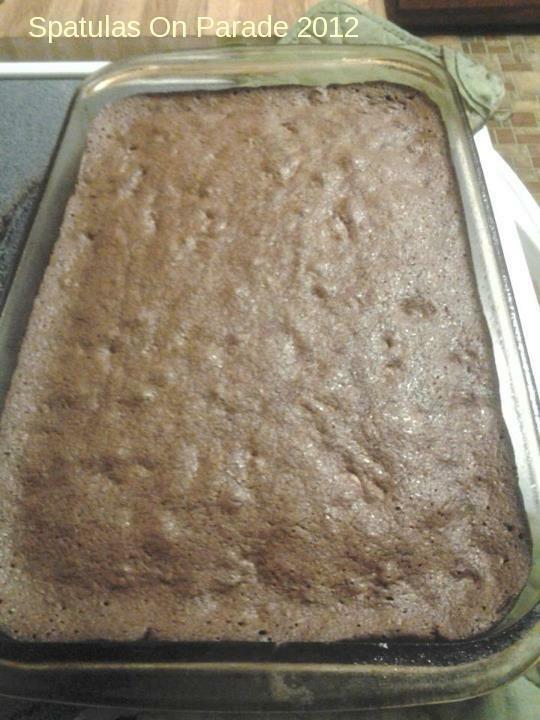 Cut into squares after its done, should make 12 servings depending on how big of an eater you are feeding. I cook the sausage, onions and pepper in a large skillet until done. Then drain the oil off. In a large bowl mix the eggs, milk, and spices. Spoon the cooked meat/veggie mix into the pan and then pour the liquid mix over the meat. Top with the cheese. Place into the oven until eggs are done and set. Depending on how deep your pan and how 'done' you want your eggs, the time varies from 30-45 minutes. Sometimes I only use vegetables and at times I add small diced cooked potatoes to the mix. Frozen hash-browns will work just as well. You can use different types of cheese if you like. It's your dish, your house, do it your way. I am a chocoholic and my family loves sweets as well. One evening after supper I wanted something sweet but to be specific I wanted chocolate. Brownies of course would hit the spot. However, we did not have any. So into the kitchen I went. Here is a basic brownie recipe that you can jazz up or fix as is. I rarely leave it as is. I have been known to add coffee, nuts, marshmallows, chocolate chips, crushed Heath bar, crushed Oreo cookies, and many other things to my brownies, not all at once mind you. However, I do combine some of those items. Melt the butter, stir in the sugar and vanilla. Mix well. Add the eggs one at a time and stir well. Add the remaining ingredients. Pour into a greased 13 x 9 pan and bake. Top with syrup, ice cream, or enjoy them as they are. In the picture below, these brownies had nuts and coffee in the mix. As you can tell, we eat a lot of chicken. Due to my health I do not eat pork and am on a restricted diet as far as red meat is concerned. I am always on the lookout for new recipes. We love chicken Parmesan but it is a lot of work. So when I found this recipe, I knew this would be a keeper. 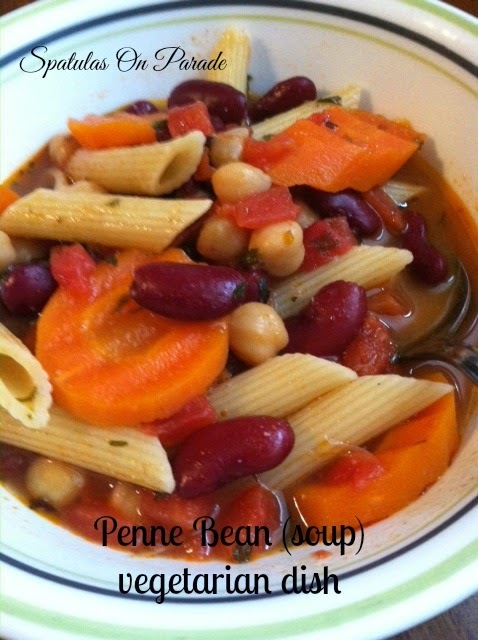 Now i added penne pasta and more sauce to the recipe but you can omit those if you like. Cut the chicken breast into bite size pieces or 1 inch cubes. Saute in the olive oil. In a large bowl add in all ingredients EXCEPT the mozzarella cheese and stir well. Pour this into a 13 x 9 baking dish and top with the mozzarella cheese. If you use uncooked pasta you will need to bake this for about 35-45 minutes on 350. If you use precooked pasta or no pasta, then everything else is cooked and all you really need is to melt the cheese until the top is a gorgeous golden color. Serve with a salad and fresh fruit. What a great meal!! And it is so much easier than how I was fixing chicken parm before! 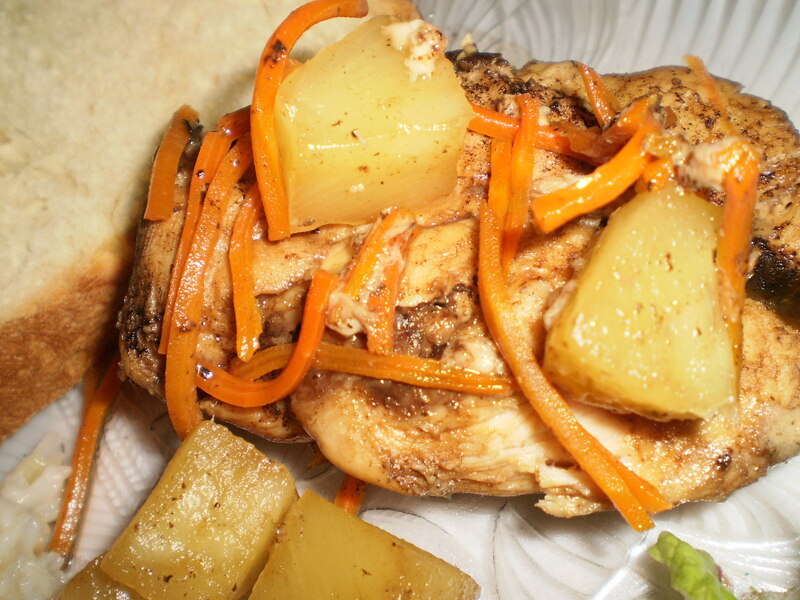 We love this chicken recipe, it is easy and tasty. 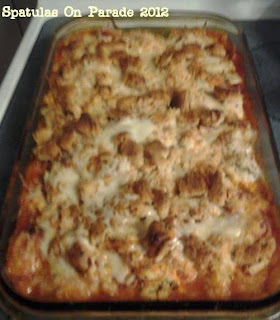 It is called Michigan chicken because the lady said her grandmother was from Michigan and this was something she made for them when they visited. They had no idea what grandma called it, so they dubbed it "Michigan Chicken". I serve this with mashed potatoes, rolls and green beans or a salad. Melt the butter and mix in the dry ingredients. Now rub or toss the chicken pieces with the mix. Place into a 13x9 baking pan, place in a 350 degree oven and bake until done. Depending on if you use a whole chicken or tenders, your time will vary. Use a meat thermometer to make sure your chicken is done, you do not want to eat under-cooked chicken. It is dangerous. 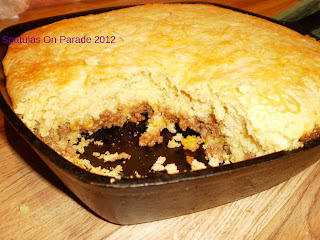 Everyone needs a good cornbread recipe, well after trying numerous versions I have finally settled on one. It was through trial and error that this was created. I bake mine in a square 9 inch cast iron skillet on 350 degrees for 30 minutes. Sometimes I top it with a shredded Colby and cheddar cheese blend. At times I will add a 1/2 cup of sour cream and about 1/2 cup of cream corn to it as well. Makes it a lot wetter but so yummy. How many of you love the Olive Garden? Seems everywhere I go I hear someone say how much they love the Olive Garden. Well, I am a fan of their salad and dressing. OK, I'll be honest, I love the bread sticks as well. 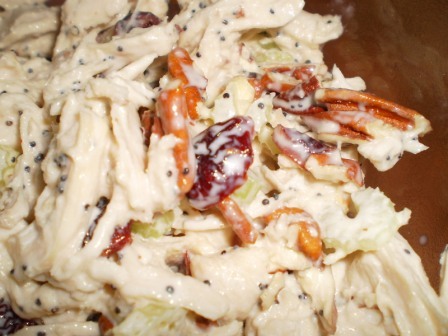 So when I stumbled upon a recipe that said it was the Olive Garden Salad Dressing, I was skeptical at best. You know I had to try it. Oh my, love at first bite. This is a fabulous dressing, quick, easy and a change from the normal bottled stuff. Mix this per the directions on the box. Use a big enough bottle to add the rest of the ingredients. Mix all of these ingredients well and add to the first mix. Shake well and store in the fridge. Let me say right off that I love lemon. LOVE lemon, so when I saw a picture of this loaf, I knew I had to try it. YUM is the first word that came out. I found this wonderful recipe on Nancycreative.com and want to say THANK YOU to her for this. Mix your flour, baking powder and salt, set aside. In a large bowl, beat the oil, egg and sugar. Then add the buttermilk, lemon juice and zest. 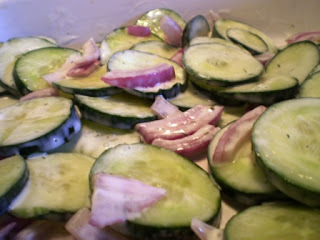 Fold in the zucchini, now add the dry ingredient mix. Pour into the prepared pan and slide into the oven. Let this bake for 45 minutes or until it is done in the center. I also zested the lemon and added that as well, for that extra lemon punch I love so much. Stir this well and pour over cooled loaf. This is a fabulous recipe. 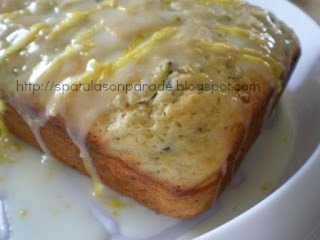 My husbands question was, why use zucchini, who wants zucchini in a bread/loaf/cake whatever you want to call it. I said, I don't know, but it's good. The proof is in the tasting! Another hit at our house. This comes at the request of my dear friend Kim. She has learned to bake bread and be a home body. Something for years that was her hearts desire. Now married and learning to cook/bake, she has become quite the little Betty Crocker herself. In a 4 quart non metallic bowl, dissolve the years in the warm water. Let this stand for 5 minutes. It will begin to bubble. Now add the flour and stir, but don't over mix and don't be aggressive. Cover lightly with a clean towel or cheesecloth. Allow to stand in a warm place for 48 hours, stir several times a day. This mix will be bubbly and will rise. It will have a sour smell, yeasty aroma and have a transparent yellow liquid on top. After the 48 hours you can store the mix in the fridge for up to 2 weeks. However, this does slow down the process and should be allowed to come to room temperature before using. Once you remove a cup of starter for your bread, you need to "feed" the mix. For 1 cup of started removed, add 1 cup of flour and 1 cup of warm water. Allow to "blend" and return to the fridge. I read an article where a lady stated she has used her same starter for over 5 years when a well meaning member of the family "cleaned" her fridge and threw it out. I hope this recipe works as well for you as it did for me. Years ago I used this recipe for probably 3-4 years before tossing the starter. It was due to a move and I really could not figure out how to take it with me 2 states away. I should have given it away but did not think about it at the time. Wow, yesterday was a busy day. I tried another bread recipe and it was a flop, literal. The dough was runny, during the rising process it overflowed but I baked it anyway, just to see. It tasted good, but fell during the baking process so it was a short long loaf, hahaha. You just never know when you try a recipe what is going to happen, especially with bread. I want to encourage you that if you had this happen, try again. Try a different recipe. I have baked hundreds of loaves of bread and not all turn out but the ones that do, oh man! My husband was home from work with health related issues and feeling puny, that's what my grandmother would have said were she still alive. So for lunch I made our easy go to recipe. Chicken and noodles. Now this recipe is not healthy but it is quick, easy and affordable. Now I normally change a recipe when I make it, however, I did not feel this one needed changes. I did omit the mustard when they said was optional and I did not use salt or pepper. 1/2 bag of egg noodles. Combine all into a large saucepan and allow to simmer until the noodles are done. That's it! Even my kids can make it. Now I have made it with my own cooked chicken, added peas, carrots and even 1/2 cup of Parmesan cheese before. The guys love it, it is fast and if we have to be somewhere or have been gone all day and nothing was defrosted for dinner, this is the go to meal. You can always add two cans of chicken and soup if you have more than four people to feed. Here are photos of my version of each of the above mentioned recipes. 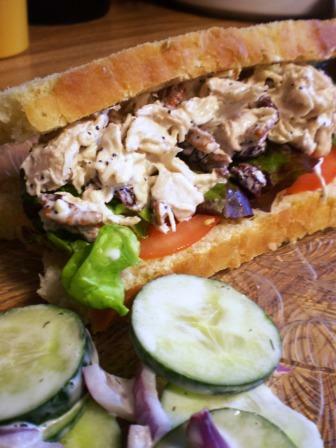 Here you see the Sonoma chicken salad on sweet bread with the creamed cucumbers. 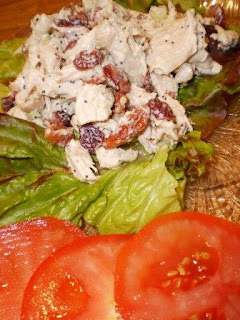 SCS on a lettuce leaf with sliced tomatoes. A close up of the SCS, very very good. Today while surfing through the news feed on Facebook I stumbled across this recipe that just SCREAMED JESSE. My son loves pizza and anything that remotely resembles pizza. I looked and found that all the ingredients were present and accounted for. So off to the kitchen I went to bake up this tasty little treats. Well, like I've mentioned before. I don't follow directions well. I added something to the mix and also made my own pizza dipping sauce as I did not have a jar version, besides this way I control the amount of sodium and spice. This is not the kind of thing I do everyday, as most days we eat leftovers for lunch or I have a salad. Here is the original recipe and in parenthesis will be my changes. 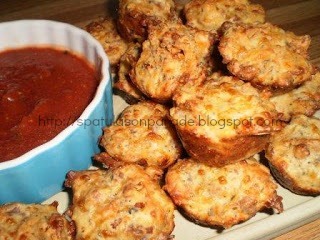 I call mine Pepperoni Bacon Pizza Poppers. Tasty little morsels if I do say so myself. Grease a mini muffin pan and set your oven to preheat at 350 degrees. Mix all dry ingredients and then add the wet. Let the batter set for 10 minutes. Then drop batter into muffin tin. Bake for 20 minutes, serve hot with dipping sauce and enjoy! As a fan of salads and raw veggies, there is the never ending goal to find new ways to eat them and present them in a manner that boys (mine especially) will eat them. If you have sons, a husband, or any other man in your life, you can attest that their idea of vegetables is corn on the cob, french fries, tater tots and anything deep fried. There are a few exceptions but most guys are "meat and potatoes" or as my son likes to say "I'm a meataterian" meaning he could go forever and not eat a vegetable. With that in mind, I am on the lookout for tasty vegetable dishes that will draw my guys in. This recipe was found recently, sounded tasty and I of course changed it, as it calls for peanuts and I didn't have any so they aren't in it. It called for a red bell pepper and my yellow one looked like it might expire before the week was out, so I used it. The original also called for hot sauce but my delicate digestive system can not handle spicy. Now if you're like my husband, you're thinking hot sauce isn't spicy. Well, black pepper can be too much for me on some days. Also, a word of warning, it calls for fresh cilantro and a 1/2 cup to boot. THAT is a lot. I like cilantro but found it over powering the first day but after day 2 of the slaw it had mellowed out. The second time I made the slaw I omitted that as well just to see if it tasted as good without it. Don't be afraid to change things up. If a recipe calls for garlic and you don't like it, leave it out. If it calls for red bell pepper and you have yellow, use it. Like most we are watching our sodium intake, cut back on the called for amount or omit it and let the diners season their own. Cooking is an adventure, so venture out! Be creative, have fun, explore and ENJOY!! 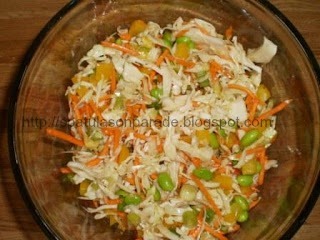 In a large bowl mix all the ingredients for the sauce, add the chopped, shredded and diced vegetables. Mix well and store in a covered bowl overnight for best flavor. 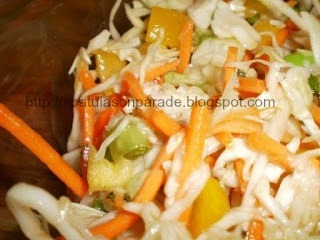 This slaw keeps well for several days and actually taste better on day 2. Stir before serving. Let me say, I found a recipe on Pinterest and thought it looked delicious. Well, if you haven't noticed, I don't follow directions well and very rarely stick to recipes. I like to wing and will always add something. So it is with this recipe. It was designed to be grilled, well, we were out of gas, charcoal and everyone was gone with the vehicles. So I improvised. I added shredded carrot, pineapple juice and chunks to the recipe and cooked it in the marinade on the stove top low and slow. WOW, the result was a flavorful juicy chicken that my husband raved over! Mix the soy, water, brown sugar, garlic, sesame oil, pineapple juice and green onions, add the chicken and allow to sit for one hour to marinate. 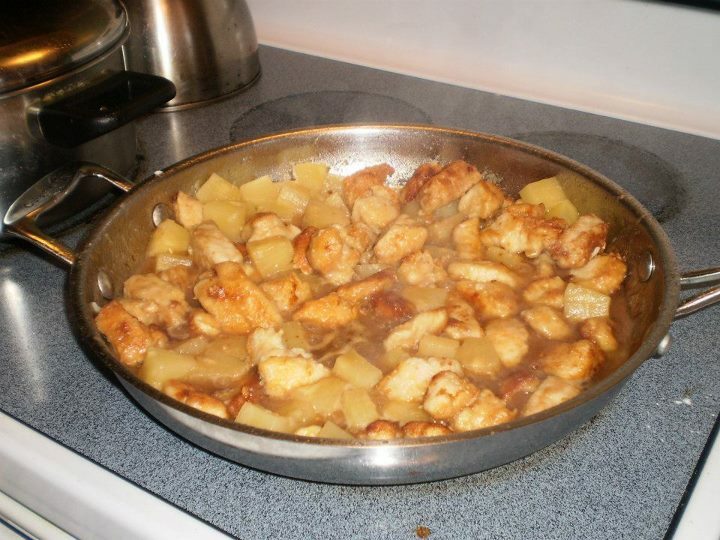 Place chicken and 1/2 the sauce in a large skillet with lid. Allow to slow cook on med./low for 25 minutes. Flip the chicken over and cook another 20. Then add the carrots and pineapple. Serve with brown rice and a salad. I don't know about you, but our family LOVES King's Hawaiian Sweet Bread, so I have been on the lookout for a recipe that would do the store bought version justice. Let me say, I'm still trying recipes. This is one I found and thought was blog worthy. 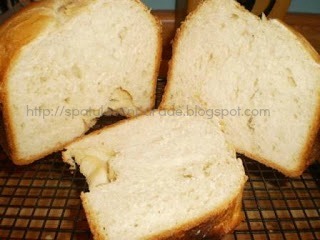 This bread smells wonderful, taste sweet but not too sweet and is soft inside with a nice crust. 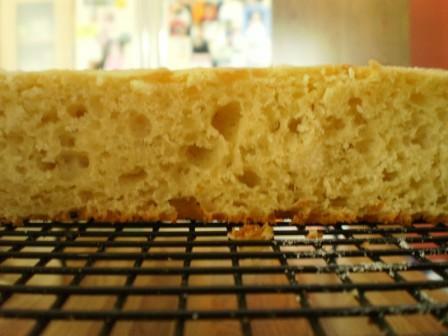 This was made in my bread machine and you could do it the old fashioned way as well. I just chose to use my machine because there were many other things going on, certainly you can relate. Mix these ingredients well in a medium bowl and set aside. Set your machine to either dough and then bake in the oven at 350 degrees for 30 minutes OR set the machine to "sweet" bread and "light" crust. Good Tuesday morning. I was thinking about which recipes to add and going through my pile of stickie notes, torn bits of paper and composition notebook, yes my recipes are a mess, and thought about last week. My poor husband had just had a tooth pulled and needed something soft to eat for dinner. Problem was I wanted to fix fajitas. Crunchy grilled veggies and steak were not what he had in mind. So, if you know me, then you know what comes next. Yes, I decided I need to come up with an alternative. After searching the web I found several easy recipes like oven bake fajitas and crock pot fajitas. Having time for neither and the only meat I had available was chicken, I improvised. I took my frozen chicken and popped it into my favorite pot, a large Cuisinart Stainless Steel pot. Best $19.99 sale item I have ever bought. Anyway, I dropped the chicken in with some leftover broth to equal about 2-3 cups. I allowed this to cook. Then I removed the chicken from the bone and returned to the pot. With this I added a red onion, a sweet onion, sliced a red and orange sweet bell pepper. And last but not least, my fajita seasoning mix. This was allowed to stew/marry flavors and served on flour tortillas. Another big hit which is good because I got carried away while cooking chicken and literally had enough fajitas to feed 14 people. Oh well, it warmed up nicely and was great for the next few days. Stirred really well and added to the dish while cooking. The original recipe that I found also called for 1/2 tsp of salt, but due to my husbands high blood pressure, I omitted that. 3/4 tsp of crushed chicken bullion cube that I omitted due to the chicken broth all ready in the pot and the last item it called for was 1/2 tsp of onion powder but since I had two types of onions this too was omitted. I am remiss to say I did not take a picture but rest assured that this is a keeper and will be repeated, so next time I will take a picture and add to this post. Now while we are discussing seasoning mixes and Mexican flavor food, let me encourage you to make your own seasonings. When my husband was diagnosed last year with high blood pressure and told to reduce his sodium I thought I was fairly conscience of this. Well, not so much. I do not cook with salt unless it is sea salt and only bought a few canned/boxed items. However, the one thing I did buy was taco seasoning mix and several a week. Was I surprised when I looked at the sodium content in one package! There was enough sodium in the reduced version to last all four of us a week much less one meal. So with that discovery I started on my search for the perfect Taco seasoning mix. I have been making this for over a year and one batch normally last me 2-3 months. I use a clean recycled plastic container or glass bottle to keep this in. I have also used this in chili as well with an added tsp of chili powder. Stir well and store in an air tight container. Keeps for several months. I saw this on Pinterest and thought it looked interesting. Well, it is delicious is what it is! 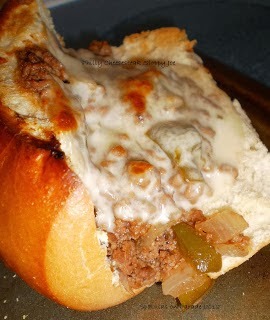 I used hoagie rolls from the bakery because I did not have time to bake my own. Slice them open and filled 6 with the meat mixture. Then each was topped with a slice of provolone cheese. This was placed under the broiler for 3 minutes. Viola done! Delicious. It was a great hit with my meat loving guys and I thought it was pretty darn tasty myself. So, here we go. 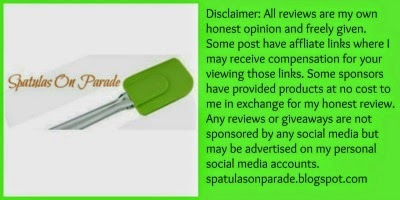 I have been asked by many of you to write a blog for some time now. This is me, biting the bullet/spatula so to speak. 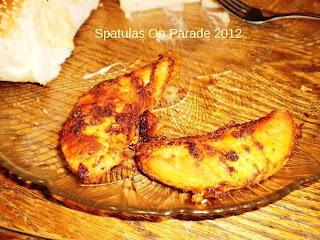 I will be posting some of my favorite recipes, writing recipes and posting pictures. This is a work in progress, so please bear with me as I embark on this journey. One of my recent recipes is a family favorite. It is called Morning Kisses. It is a sweet delicate fluffy morning treat. I do not do these often, this keeps them special. I found this recipe over a year ago on www.justapinch.com , this is one of my favorite places to find recipes. In a medium bowl, combine the ricotta and eggs, mix well until smooth and creamy. 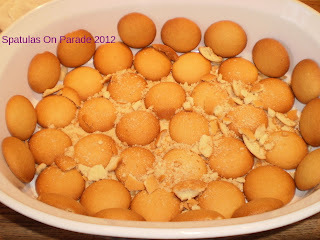 Now add the extracts and mix, then add the dry ingredients. Mix well. In a large shallow skillet add approximately 1/2 inch of oil. Allow it to get hot enough to cook the batter when dropped in but not smoking hot. Now drop the mix by the spoonful into the oil. I swish the oil so it covers the top of the drop, allow the MK to become golden on the bottom and flip over. Cook until done. This takes about 4 minutes total time. Do not add more than 6-8 drops in the skillet at a time so as not to crowd them and this will allow a better cooking time. Drain the kisses onto a tray lined with paper towels. Once they are done, sprinkle with powered sugar and enjoy! I hope your family enjoys these as much as we do.